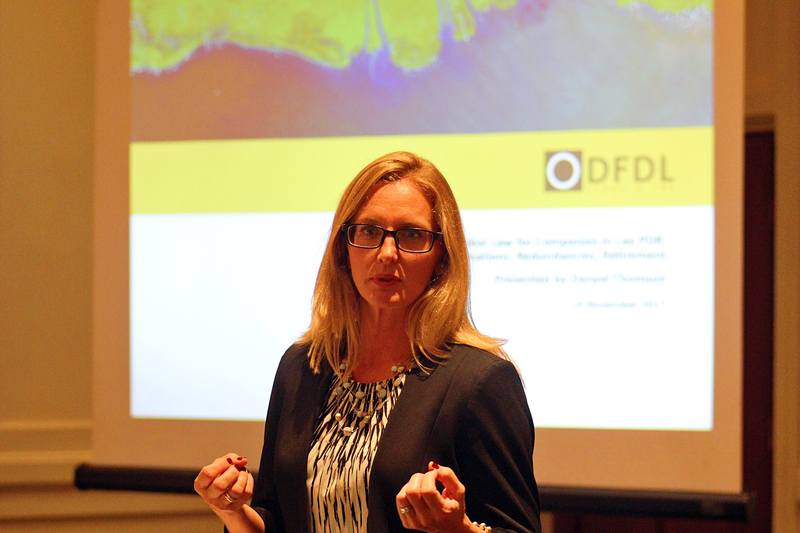 Head of the Regional Employment Practice Group Danyel Thomson, hosted two DFDL seminars in Vientiane on 14 November and led discussions on current Lao employment matters with some of our key clients and various assembled guests. Danyel delivered the morning seminar ‘focusing on Fixed-Term Contracts, Severance Pay, Retirement’ which was attended by 46 individuals representing 33 different organizations, INGOs, and embassies. In the afternoon, she went on to deliver another seminar specifically tailored to commercial enterprises, featuring topics such as transfers, terminations, redundancies, and retirement planning. This was attended by 33 individuals from 19 companies registered in the Lao PDR. This event was a resounding success, very well-received by all those present, and it has led to numerous follow-up queries and interest on the various issues and employment matters under discussion. For any enquiries, please do not hesitate to contact info@dfdl.com.